Our Outpost Camps are one of the things that sets Dusey River Adventures apart from the rest. We take pride in maintaining quality camps, from the cabin and amenities to the boats and outboards, we aim to provide you with modern, comfortable accomodations so you can focus on enjoying your stay. Hanover Outpost is our only drive to destination. It is a one hour drive northwest of Nakina. It is the only cabin on the lake. Hanover Lake surafe area is 8 square miles and the lake is 80 feet deep. Excellent grouse & woodcock hunting in the area. Tyler Lake Outpost is 70 air miles north of Nakina. 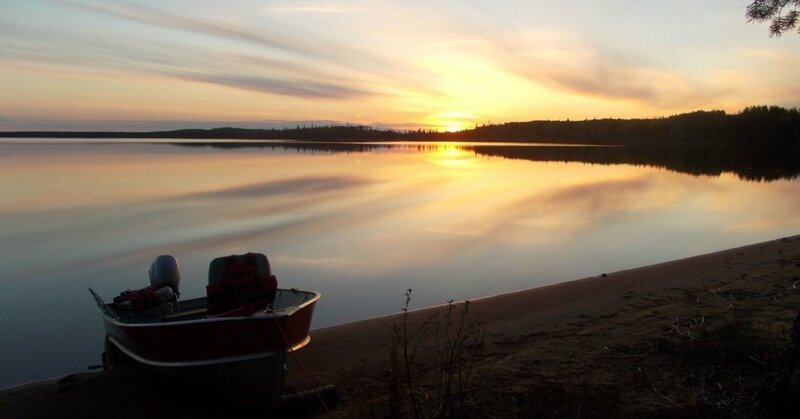 Tyler Lake has over one mile of white sand beach and is the only cabin on the lake. Tyler Lake is approx 5 sq miles, with 30 miles of shoreline including Dusey River's 20 miles of access. Tyler Lake has a depth of 58 feet. Dusey Lake is 24 ft. deep. Fish species includes Trophy Pike, Walley, Yellow Pearch and Whitefish. Boating into Dusey River offers Brook Trout of a lifetime!